Jena: Stop Deportation Parade! In Protest against the G20 Summit and the wars against Refugees!! We calling to protest the summit of G7 / G20 conference in Hamburg on the 6th and 7th of July this year. The So called „leaders“ of the WORLD war military arsenals are meeting to use the summit to clean the bloods on their hands, to celebrate their war crimes and to legitimize their global exploitation, the proxy wars and the terrors in the refugee countries. The world leaders are too corrupted to ignore the wealth of the African nations and the refugee countries they have always exploited. They are the living Vampires and the mothers of all bombs. We are here because you destroy our countries, seeking safety and security and not because we love your potatoes so much. Refugees do not create wars; on the contrary wars create refugees. Your economic and extensive political interests are creating and perpetuating wars in our countries, leading to its destruction and as well as our means of livelihood. We as refugees are the result of your continued colonial ideology and exploitation, your greed and gluttony that are boundless. You may fool your citizens with empty platitudes and lies, but you won’t fool us. Refugee Solidarity Rallies and Parade - Lets organize to stop the deportations! 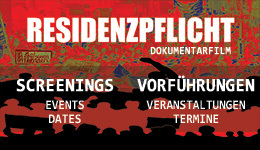 We want to invite you to our planning meetings and events taking place in June and July with the Refugee Community in Thueringen to mobilize against the German deportation regime. We want to remind the state that we refuse to live in fear and will not be intimidated by their treacherous and cynical tactics and deceptions as we fight to reclaim our freedom and human dignity. Neither the state abdication of its responsibilities to guarantee our safety and security nor the fear mongering right wing and racist arsonist will deter us. We are here and we will fight and we are here because you destroy our countries. We are planning and organizing political meetings, workshops and Seminars and a continued documentation of the everyday lives of refugee experiences in this country. There will also be protest, rallies and protest parade in the city of Jena against deportation. We call on all refugees to organize to stop all deportations. Please contact us if you are interested to participate and we hope to follow this up with details of the plans in the next weeks. Your story is your weapon - speak-out in solidarity with the refugee community struggles and take back your freedom now to fight for justice! We have a Mission to bring down the deportation regime. Join us in this task by building your community to organize and mobilize with us to do it. Share your stories and inspire and empower others with it. No fear!!! Fear can only create a weakness that the authorities will exploit. Stand up and fight, and others will be inspired and build solidarity accordingly. We need donations and your solidarity to carry on and finance this struggle for justice.